This set of Network Theory Multiple Choice Questions & Answers (MCQs) focuses on “Supermesh Analysis”. 1.Consider the circuit shown below. Find the current I1 (A). Explanation: Applying Super mesh analysis, the equations will be I2-I1=2 -10+2I1+I2+4=0. On solving the above equations, I1=1.33A. 2. 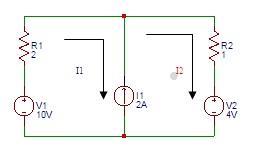 Find the current I2 (A) in the circuit shown in the question 1. -10+2I1+I2+4=0. On solving the above equations, I2=3.33A. 3. 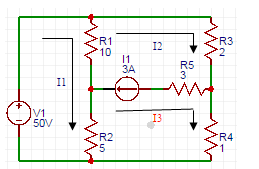 Consider the circuit shown in the figure. Find the current I1 (A). Explanation: Applying Super mesh analysis, the equations will be I1+I1+10+I2+I2=0. I1+I2=-5. I2-I1=1. On solving, I1=-3A. 4. Find the current I2 (A) in the figure shown in the question 3. Explanation: Applying Super mesh analysis, the equations will be I1+I1+10+I2+I2=0. I1+I2=-5. I2-I1=1. On solving, I2=-2A. 5. Find the power (W) supplied by the voltage source in the figure shown in the question 3. Explanation: I3-I2=2. As I2=-2A, I3=0A. Th term power is the product of voltage and current. So, power supplied by source= 10×0=0W. 6. Find the current i1 in the circuit shown below. Explanation: The current in the first loop is equal to 10A. So the current i1 in the circuit is i1 = 10A. 7. 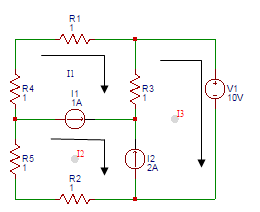 Find the current i2 in the circuit shown in the question 6. Explanation: For 2nd loop, 10 + 2(i2-i3) + 3(i2-i1) =0. For 3rd loop, i3 + 2(i3-i2)=10. As i1=10A, On solving above equations, we get i2=7.27A. 8. Find the current i3 in the circuit shown in the question 6. Explanation: For 2nd loop, 10 +2(i2-i3) +3(i2-i1) =0. For 3rd loop, i3 +2(i3-i2)=10. As i1=10A, On solving above equations, we get i3=8.18A. 9. Find the current I1 in the circuit shown below. Explanation: Applying Super Mesh analysis, (10+5)I1 – 10(I2) – 5(I3) =50. 2(I2) + I3 + 5(I3-I1) + 10(I2-I1) =0. I2 – I3 = 2. On solving above equations, we get I1=-8A. 10. Find the current I2 in the circuit shown in the question 9. Explanation: Applying Super Mesh analysis, (10+5)I1-10(I2)-5(I3) =50. 2(I2) + I3 + 5(I3-I1) + 10(I2-I1) =0. I2 – I3 =2. On solving above equations, we get I2=-7.3A.